Monday Lunchtime Sketch Challenge 107! Re-cap of sketch challenge 106 players! 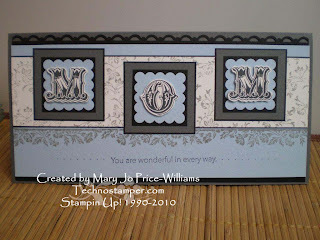 A few more stampin connection challenges! Quick - Easy-Cute and for the kids. For the Birds==Valentine that is. 411 Birthday and What the heck was I thinking?! Brads Brads and More Brads! More Abundant Hope for the New Year! Phew! This has been one busy day. I am excited to welcome you to my Monday Lunchtime Sketch Challenge 106! I hope you will play along. If you do be sure to come on back and link up your sample on Mister Linky below. 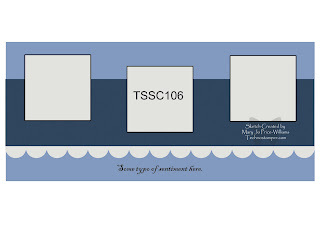 As usual I am combining it with my DT submission for the Latenightstampers group. This week's challenge is going to be Vintage. Way out of my comfort zone here. Be ready to see some samples that are not quite me. I am still deciding if I like them or not. Anyway here is the first one, using this sketch challenge. Do you even think it looks vintage? I love the colors, lol. I can't wait to see what you come up with. I may have to try it again non-Vintage, lol. Mary Jo, this is a lovely vintage card! Great job! What a beautiful card this is! Yes, it looks vintage and it is very pretty! I just love these letters and you really did a great job putting this card together. Your vintage Mom card is great. I love those letters! Your card is wonderful--wish my mom was still on the planet--then would just have to have that set too! Finally got in under the deadline, this year has started out with a bang.Love your sketches, I appreciate all your hard work.